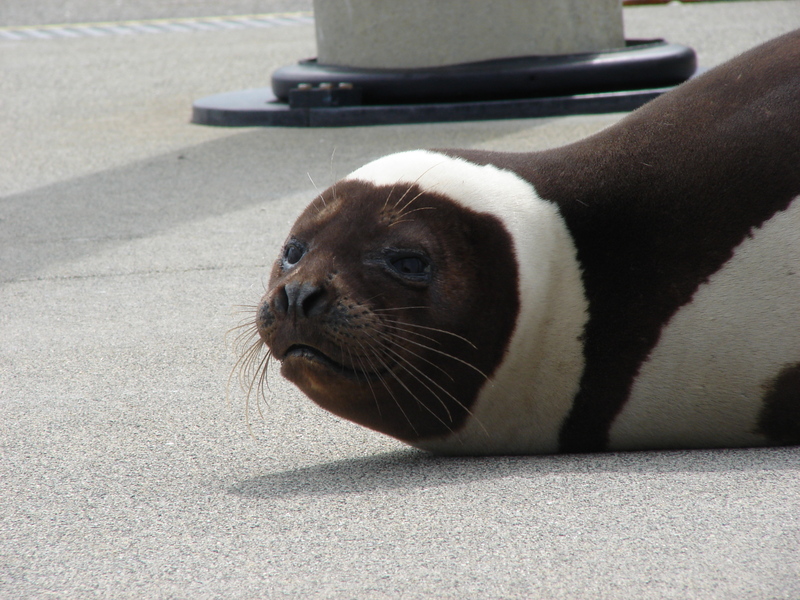 The Ribbon Seal is native to the North Pacific, from northern Japan to the Aleutian Islands. 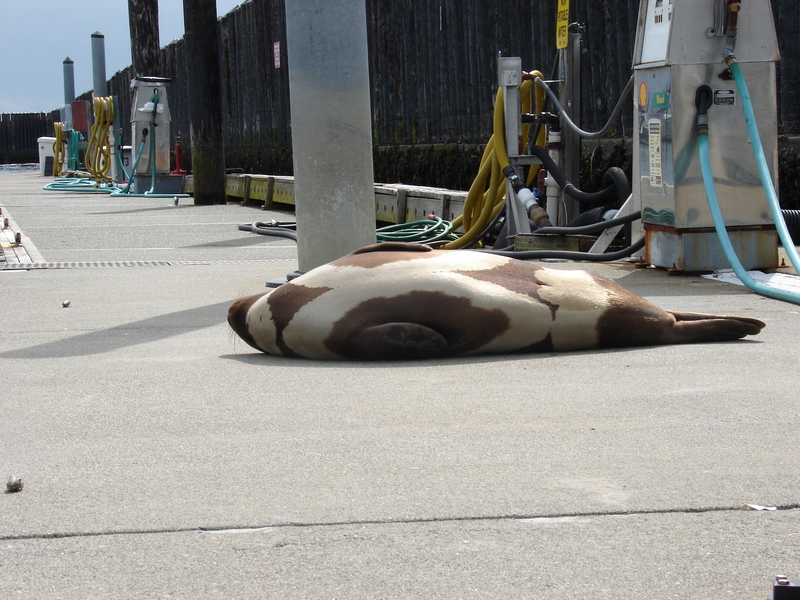 This guy showed up on the Anacortes Marine Servicecenter fuel dock. I’ve never even heard of them before. 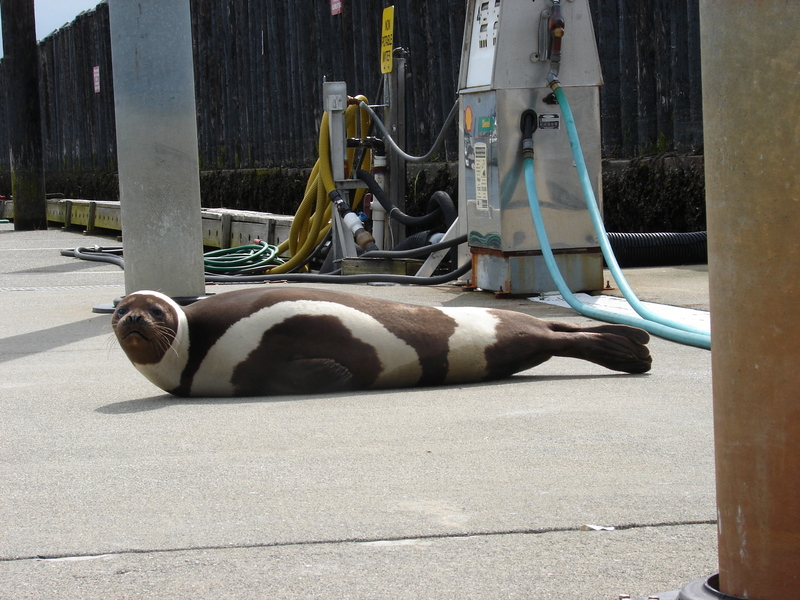 He was kind enough to roll over so we could get a good look at his awesome seal wonderfulness. 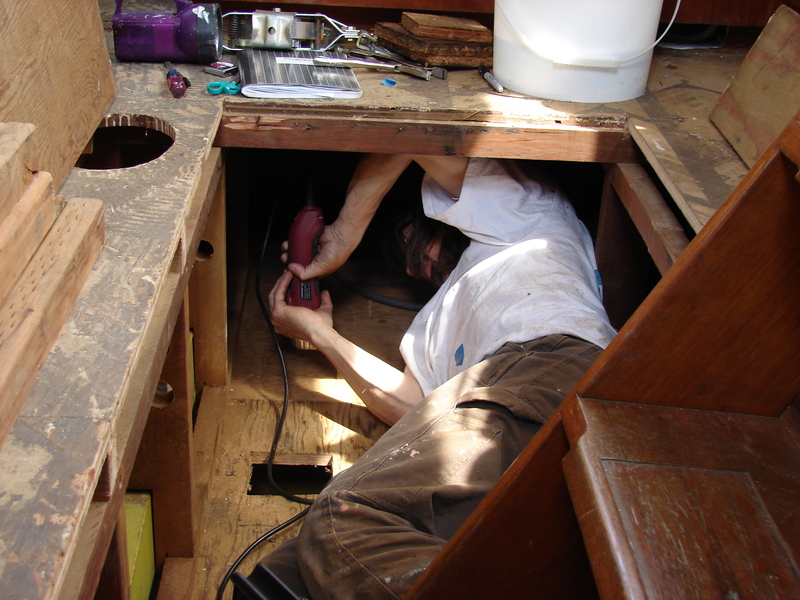 In other strange news, we cut some holes in the floor trying to clear the bilge drain system. We found three bays that didn’t have limber holes. One of them was full with at least eight inches of water. Now the bays have limber holes. Less water inside the boat is better. 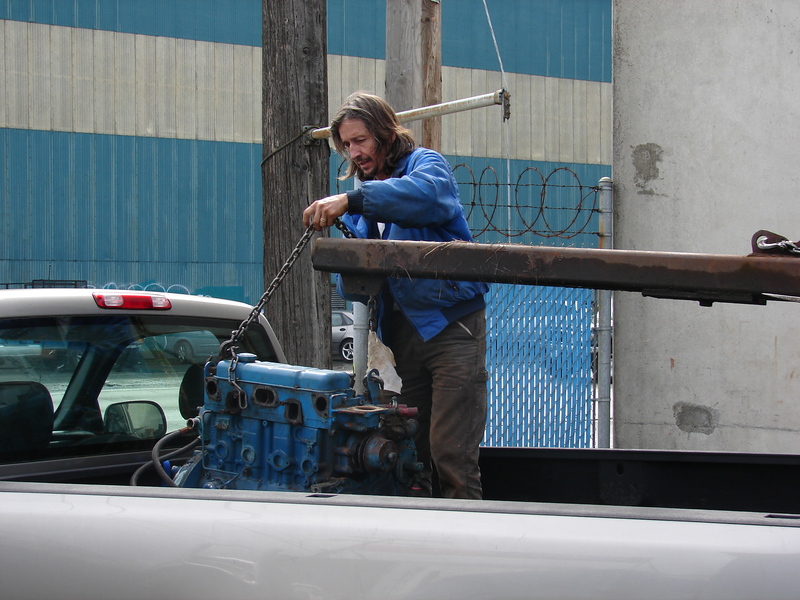 We’re still fighting with our water tanks. G-Flex, the amazing new glue that sticks to polyethylene, actually sticks to polyethylene, so we fixed the original leak. But wait, there’s more! 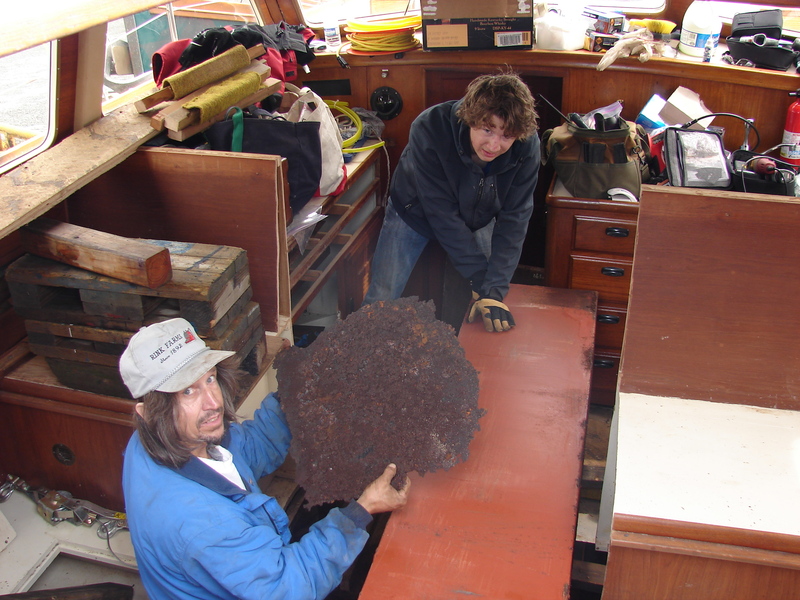 Apparently the starboard tank didn’t get the word on the whole “fixed” thing, so we cut it out of the boat. 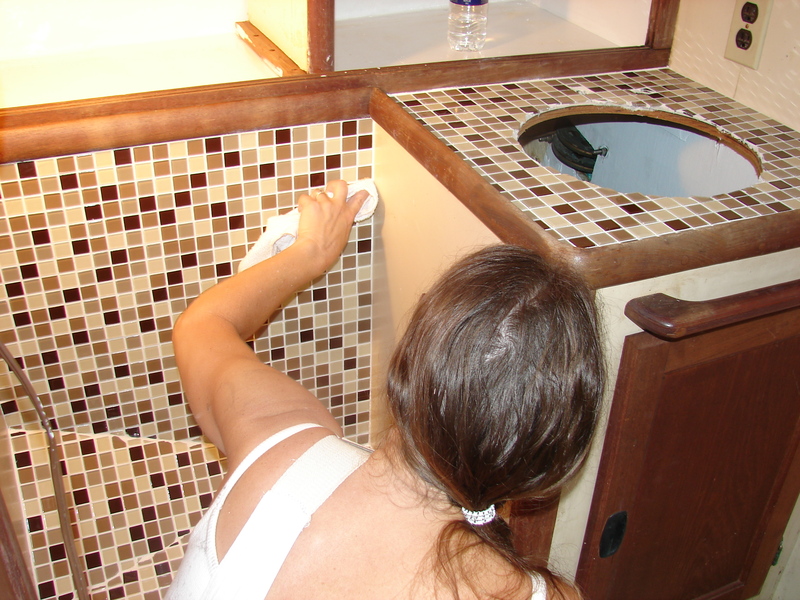 This involves removing the structure under the cabinets. Not great. What was great was another chance to use the Harbor Freight $18 multi-tool. Too much fun for work. …and it’s out. The yellow ick is the miracle glue. 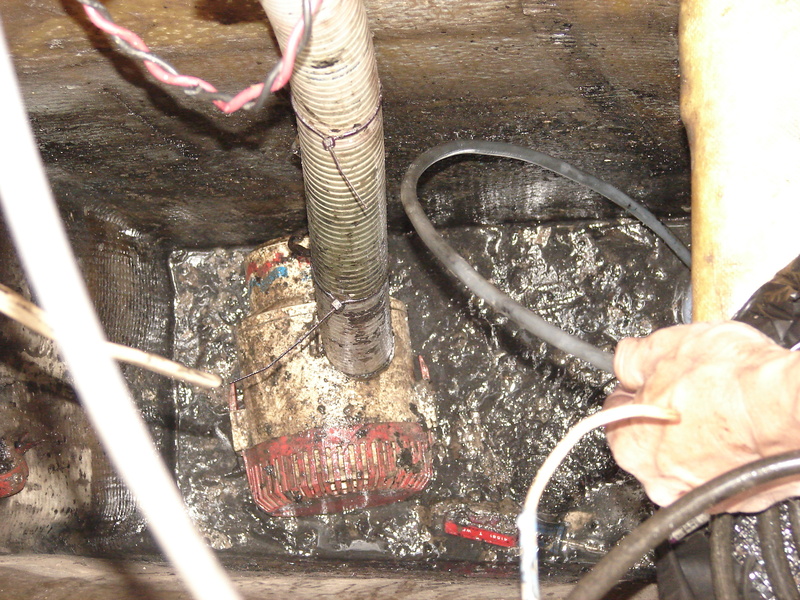 If you spot the leak let us know. Tomorrow we’ll blow it up like a balloon. 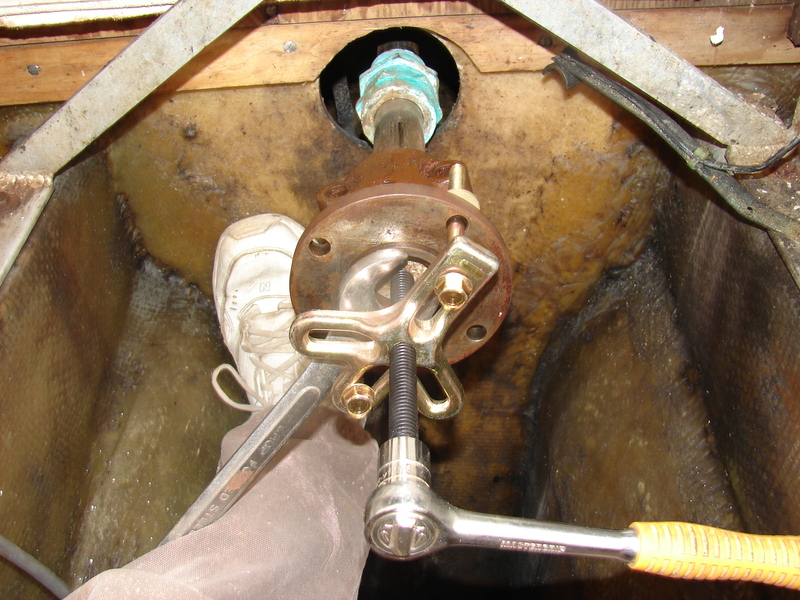 If it doesn’t pop we’ll find and fix the next leak. There is a slight chance that the tank doesn’t actually leak. 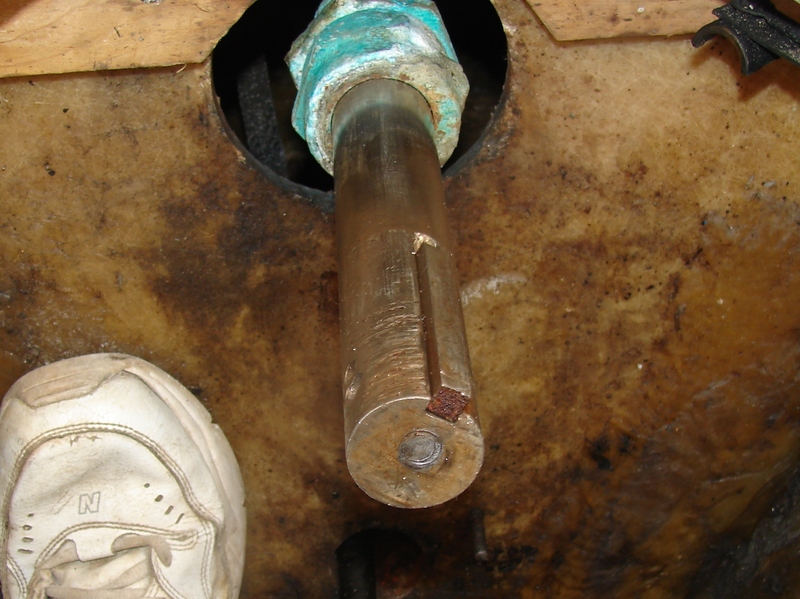 It started raining right when we filled the tank, and a deck leak may be running down the inside of the hull, onto the top of the tank, and dripping off the drain fitting. That seems unlikely. 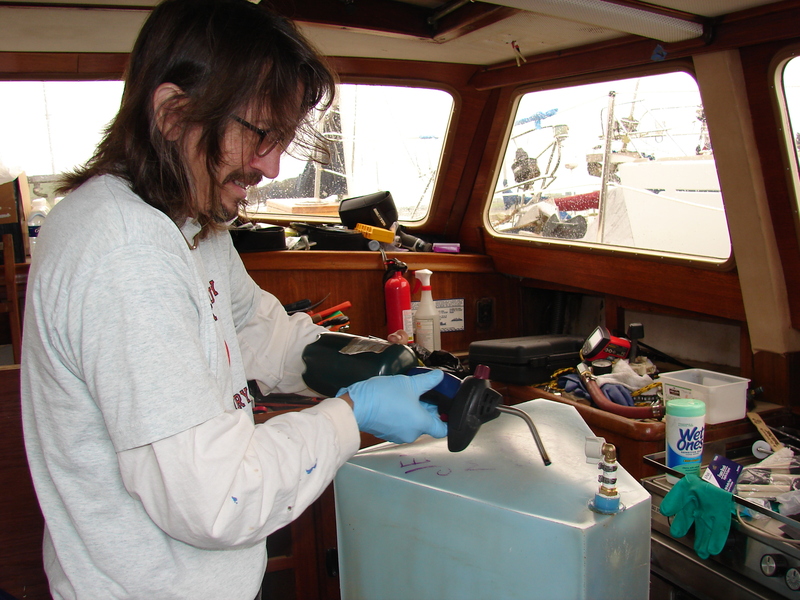 Nancy continues turning the dirty boat into a clean boat. White is better than filth. If you’ve known me for very long, you’ve probably gotten the ladder lecture. Falling off a ladder, even from a fairly low height, is a common and stupid way to become disabled. In fact, Nancy and I recently reviewed our activities and decided that the most dangerous thing for her healing back is climbing on and off the boat. So our buddy Larry was exactly correct when he told us to stop using such a crappy ladder. We brought up a better ladder. …in a not accomplishing very much sort of way. 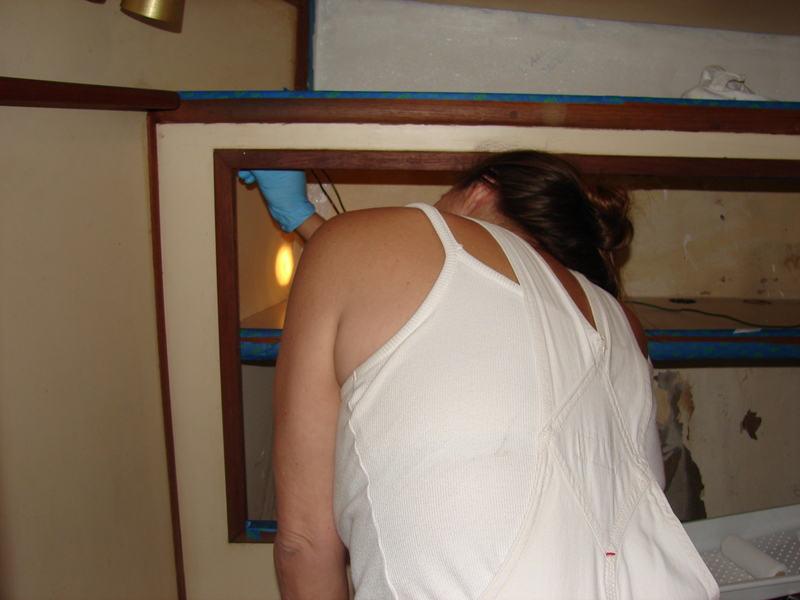 Seven weeks after major back surgery, Nancy is starting to paint the insides of the cabinets. We figure they’re as clean as they’re going to get. One coat of white Kilz Primer, then one coat of white Rustoleum. Presto-chango: CLEAN! 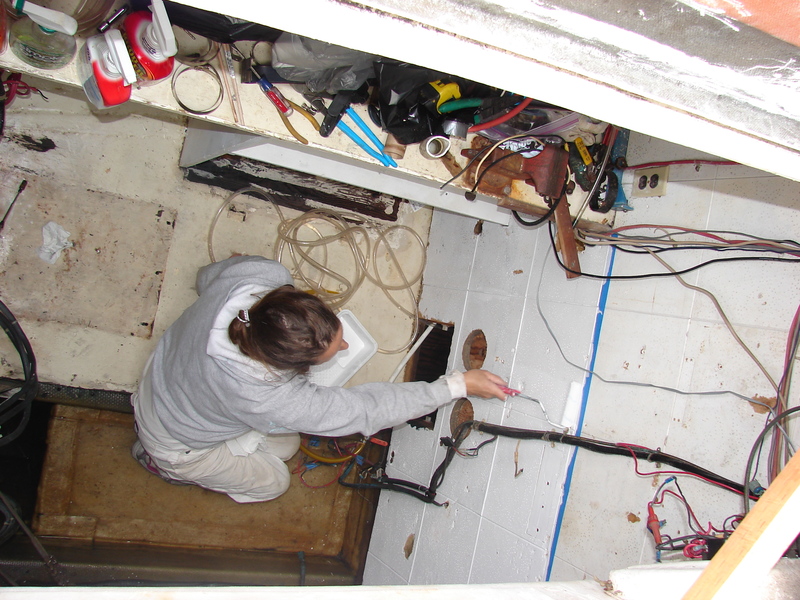 If you’ve never painted the inside of a boat before, it’s an incredibly crampy job. No way to be comfortable. Today we glued the reinforcement on the cracked tops of the water tanks. We used special G-Flex epoxy that sticks to flame-prepared polyethelene. Quick tech note: If glue sticks to polyethelene, how do you clamp it? Hmmmm. Hopefully we’ll have pictures tomorrow of the successful repair. 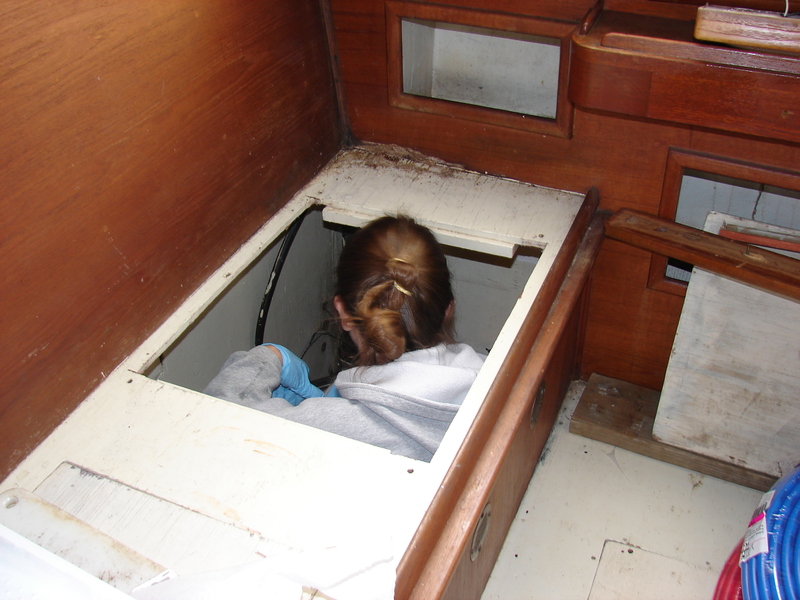 We also got to the bottom of the bilge sump. Craftsman Screwdrivers are guaranteed for life, so we’re good there. Under all that gooey goodness was two to three inches of asphalt I had to break out with a hammer and chisel. I’m not kidding. I’m not wearing a shirt because this crap will wash off skin but will not wash out of fabric. It’s nasty. We had a couple of great friends come by the boat today, offering to help. Lots of things to do. Thanks to Matt and Mark. We did whatever Nancy wanted to do on Mother’s Day. 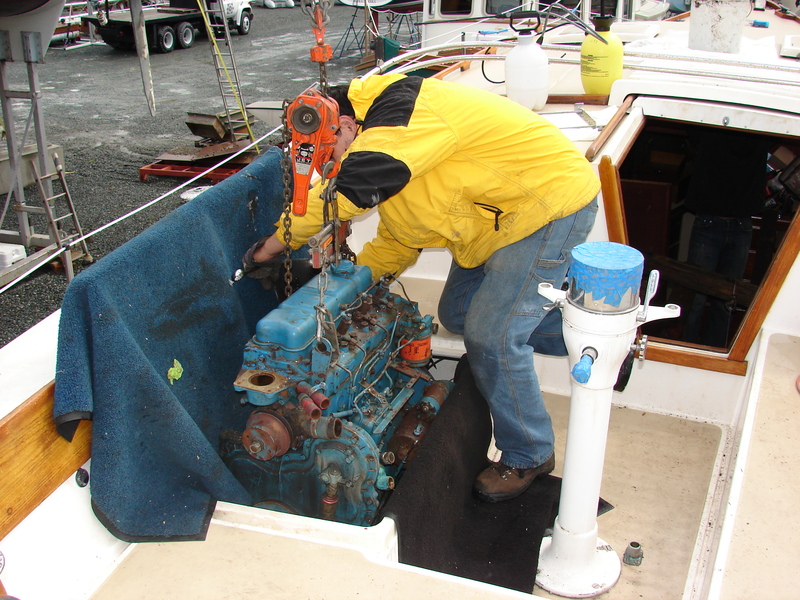 That’s right, we worked on the boat. We cleaned and cleaned and cleaned. 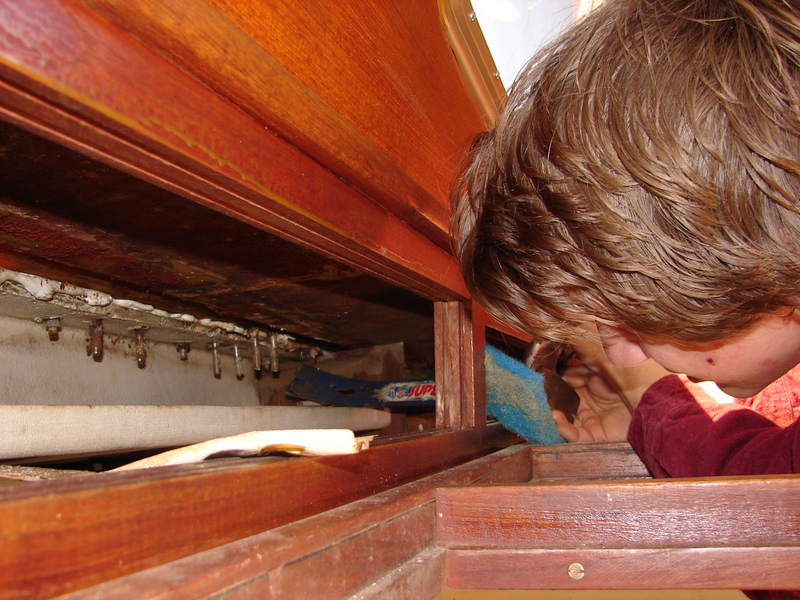 I can’t believe how much time we’ve spent cleaning this tiny little boat. 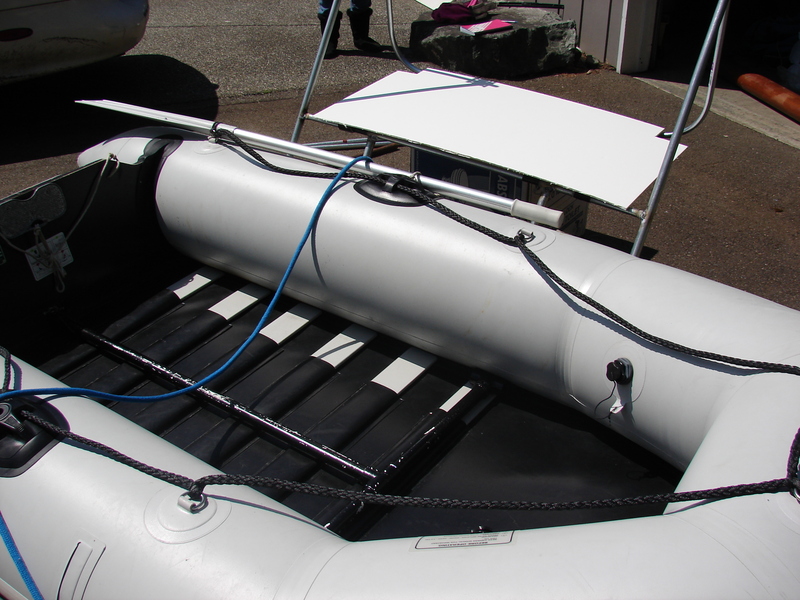 Yesterday, we trial fit the swim step/dingy mount conduit prototype. It worked great. After a few little tweaks we’ll get the real one made. Here’s the thing in the down position, as a swim step. The two ladders make for easy water access and keep dingys from washing under the platform. You can see the waterline in the bottompaint on the boat. The platform is not flat. That’s easy to fix. 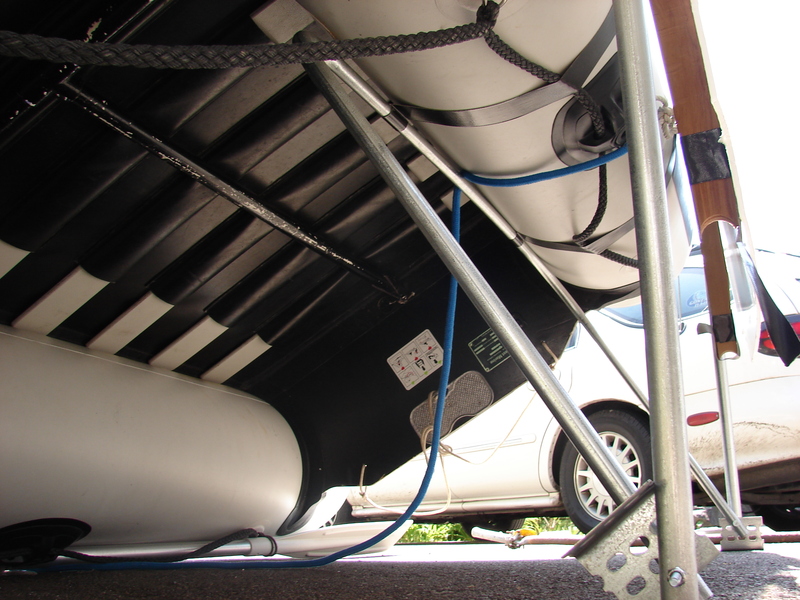 The dingy hangs a little low, but the the same fix that levels the platform raises the dingy. From the deck, the whole thing looks pretty clean. We’ll cut out the center rail of the pushpit when we install the real thing. 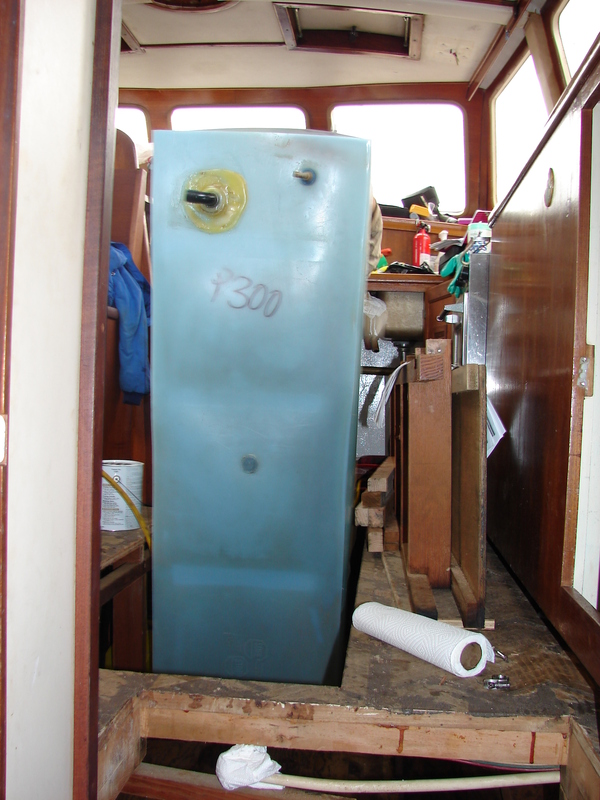 This is the dingy from our small powerboat, but the dingy for this boat will be similar. In other news from yesterday, both 75 gallon polyethylene water tanks have cracks around the fill necks. 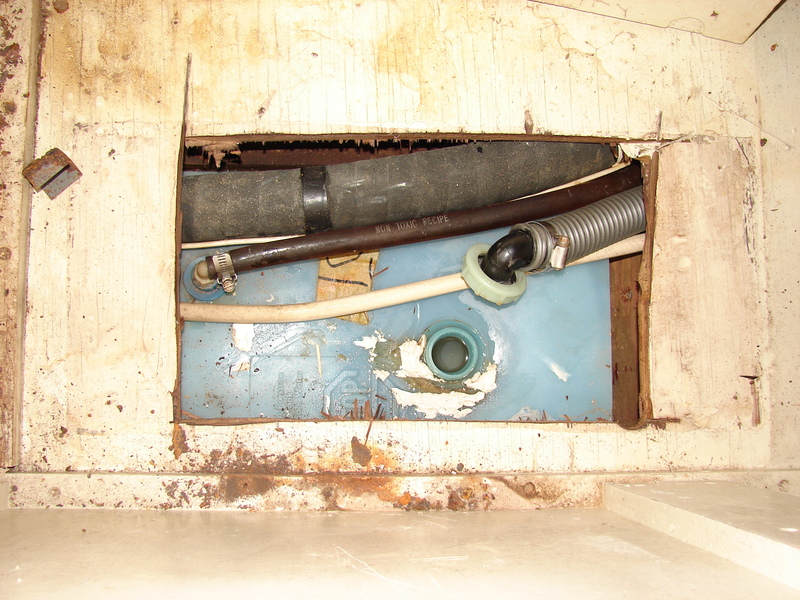 Apparently, somebody besides us knew about the problems with the port tank. The white goo is proof that gel coat doesn’t stick to polyethelene. The icky colored goo is proof that epoxy doesn’t stick to polyethelene. We’re not worried, at least they come off easily. Then we can use new glues from G-Flex or Mr. Sticky, along with some milk carton scrap, to patch the tank. The only complication is that we need to flame treat the surface to de-polarize the poly. That will be slightly more difficult to starboard. Some (more) dis-assembly will be required. I hope everyone had the Mother’s Day they wanted. We did. 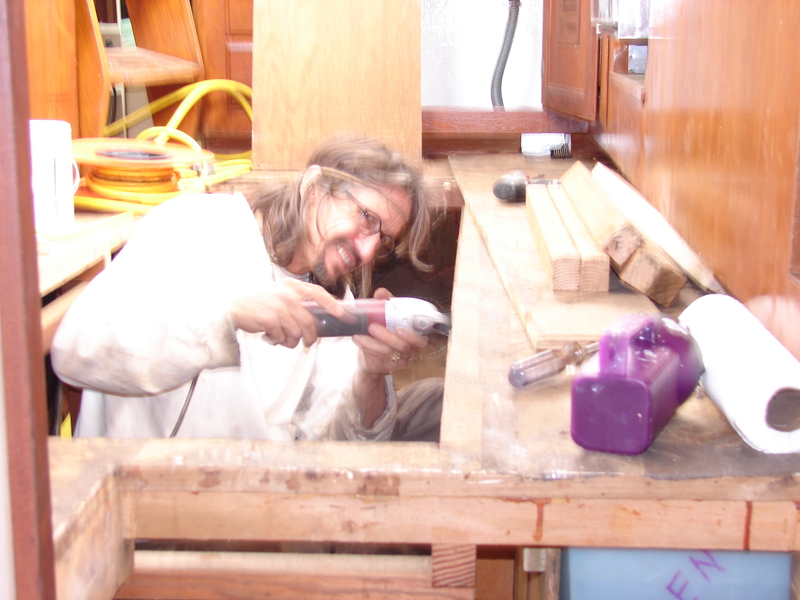 Mermaid, the boat we used in the Caribbean ten years ago, had a fantastic “sugar scoop” transom, with easy access from the dinghy and a great water-level deck to sit on while putting on dive fins. It also made it easy to retrieve people from the water, should they fall overboard. 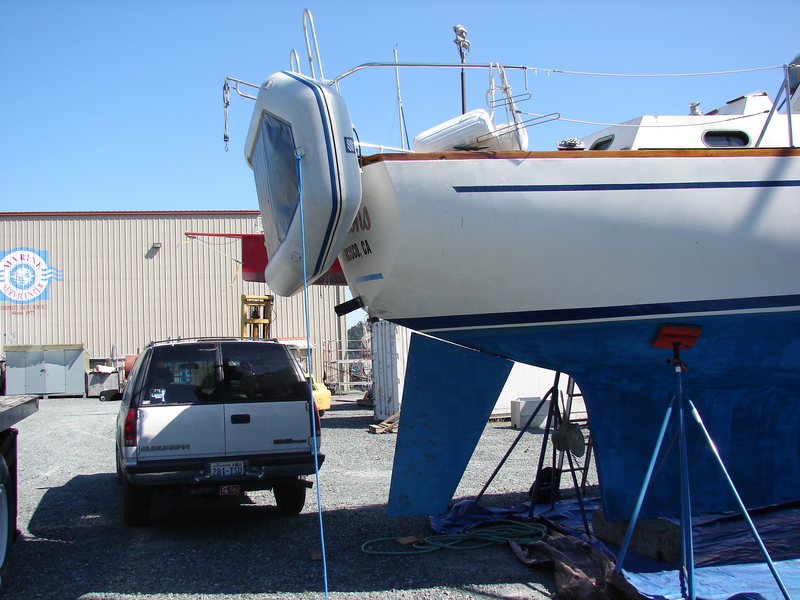 Sugar scoop transoms are now found on practically every new boat. 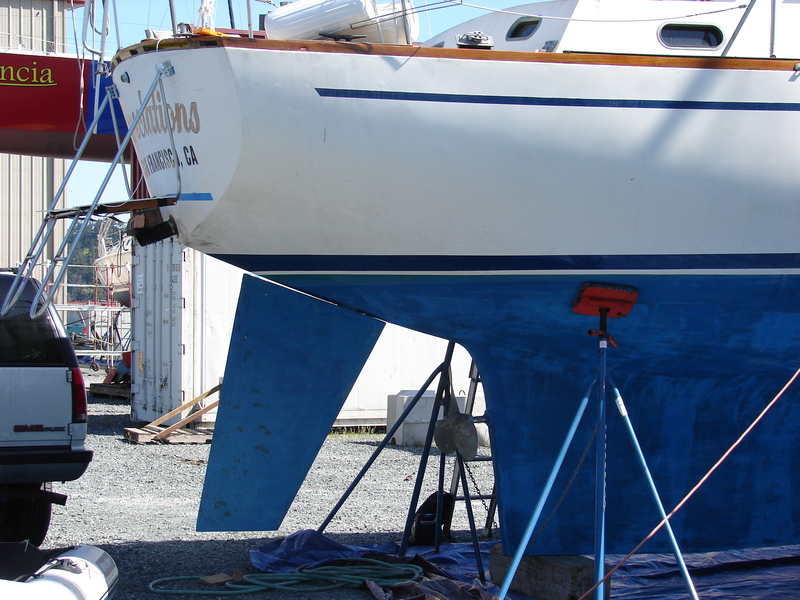 Bright Water, like many boats her age, has a reverse “wine glass” transom. It’s small, it slopes aft, and it is not meant to provide access to the boat. Visitors to boats of this era were expected to tie their dingy’s alongside and crawl up and over the rail. Swimmers in the water are completely unable to climb on to the boat unless there is someone on board to install a ladder over the side. Very dangerous. 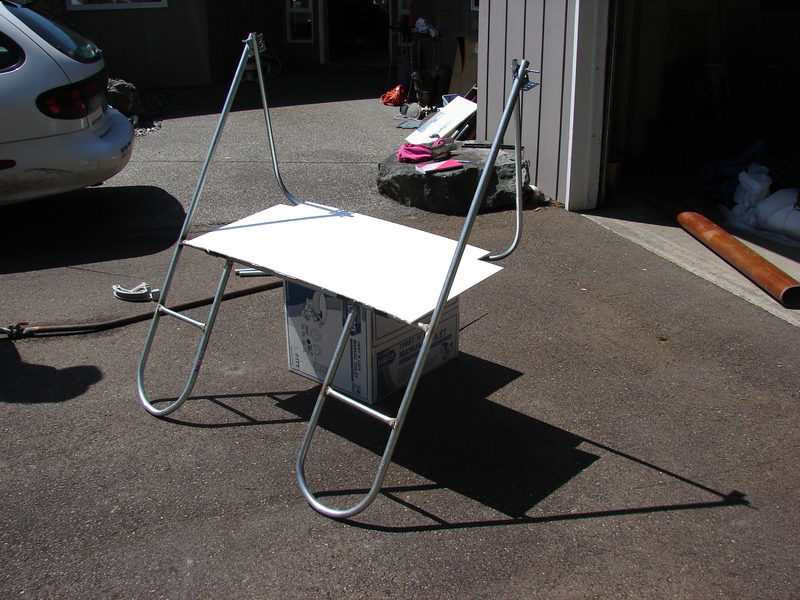 So we’re designing and building a “swing-down” swim step and ladder for the transom. Today we built a prototype out of conduit and posterboard. Here’s a picture of the prototype swim step in the down position. 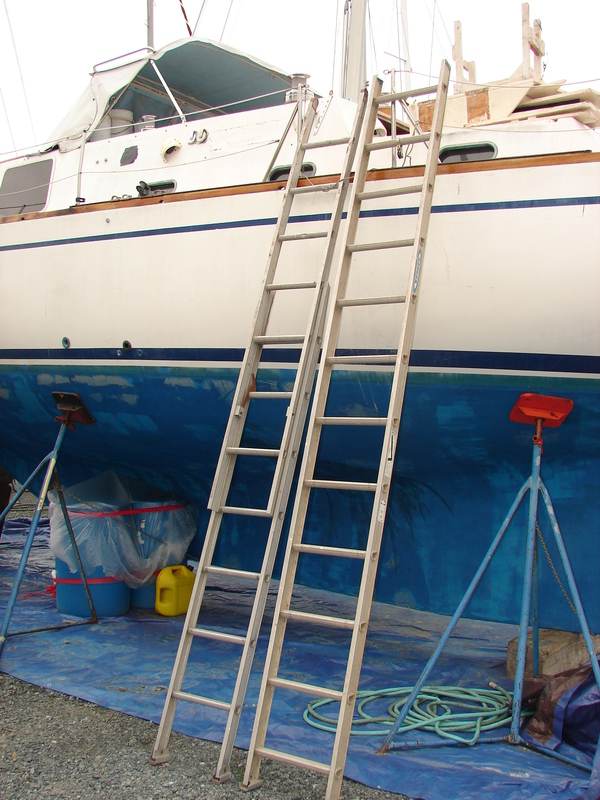 There are two ladders to keep a dingy from washing underneath the deck. 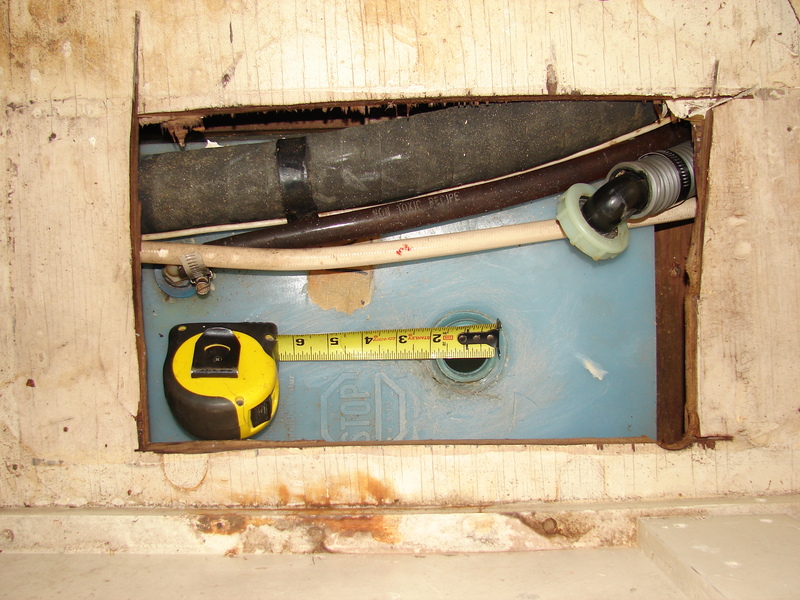 In use, the bottom step will be about six inches underwater, which is probably not enough. Here’s a picture of our smaller dingy alongside the prototype. Perfect. 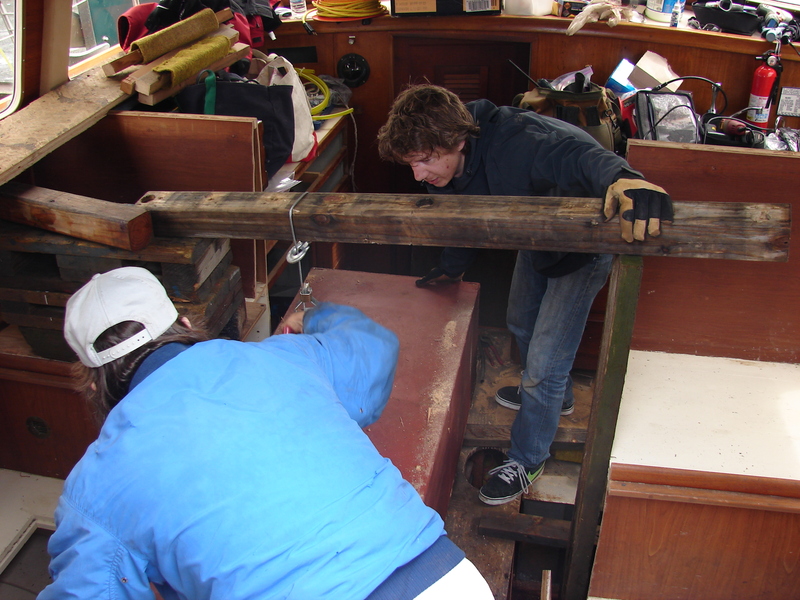 When we prepare to get underway, we flip the whole framework up and attach it to the rail on the transom. 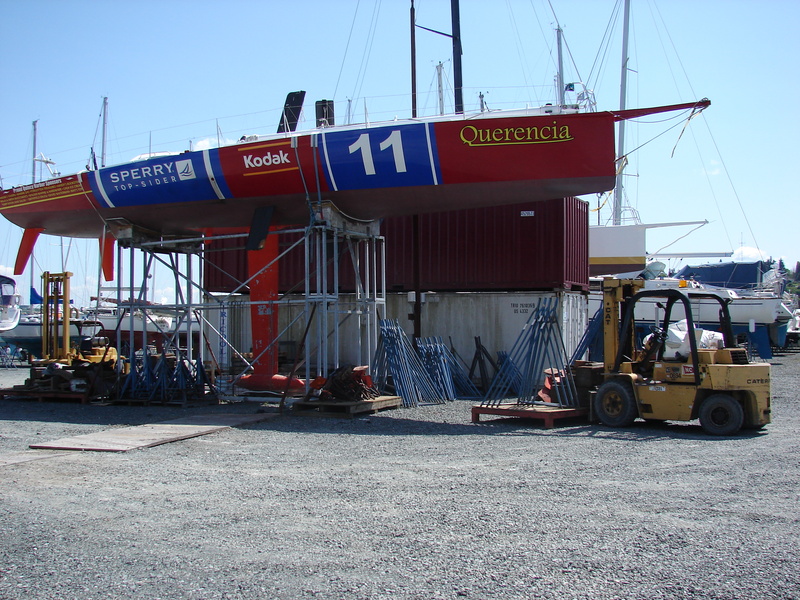 Then we disconnect the deck, which hangs vertically, and hang the dingy on slings between the two frames. 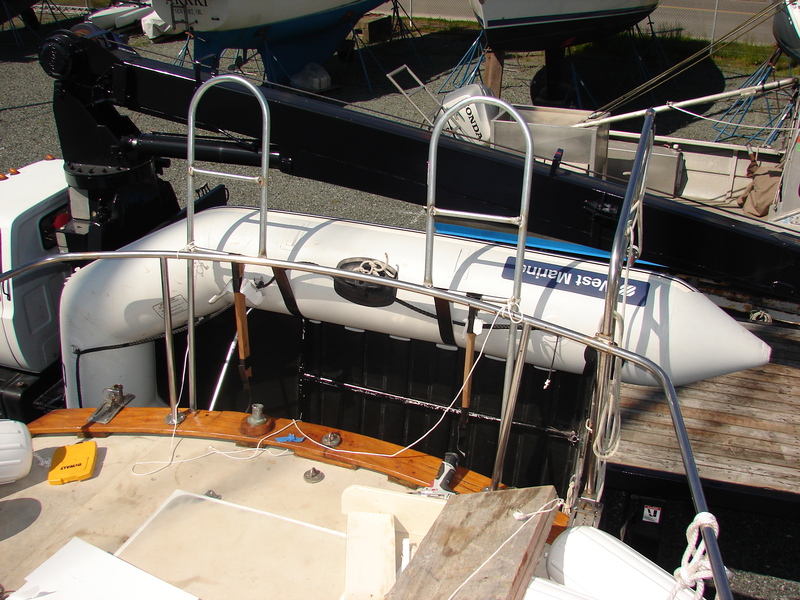 When the frame is mounted on the transom, the dinghy will hang vertically, about three feet off the water. We’ll try it on the boat tomorrow, then get the real thing built out of shiny stainless tubing. Easy peasy. Pender leaves for Jackson Lake for his summer job this weekend, but we got him for one last day. He finished one last horrible job. 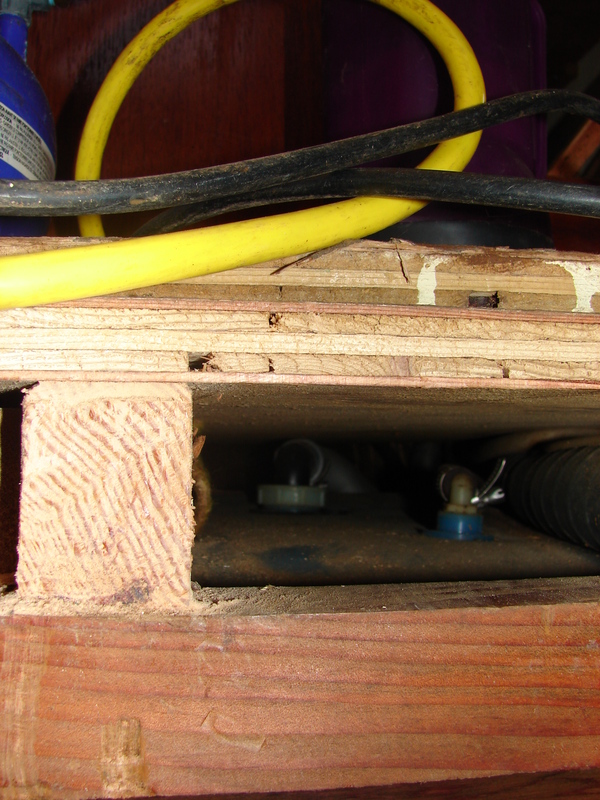 Several small deck leaks, over time, have created pockets of rotten wood and mildew. We haven’t found any rotten structure, but almost all the fascia and decorative wood needs to be pulled. 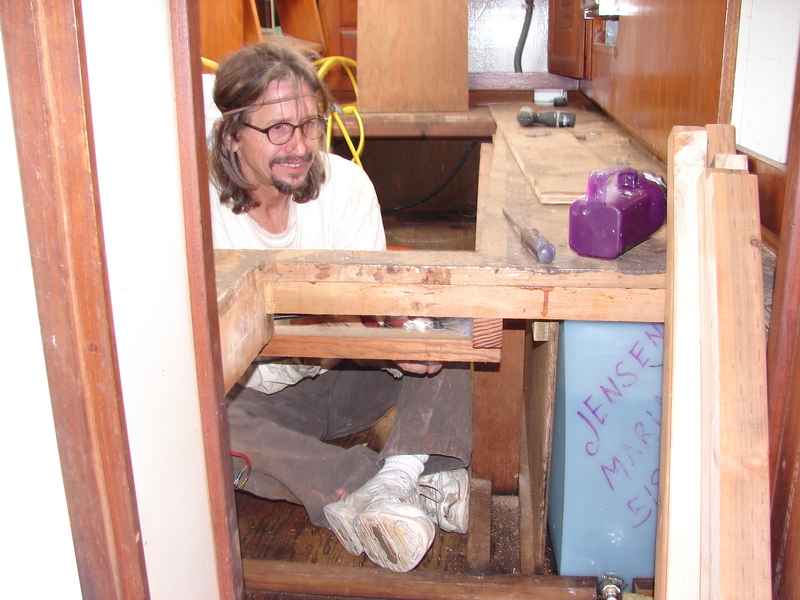 Pender got to work upside down, below eye level, on the far side of the galley countertops to pull an imbedded, vinyl covered pocket of rot. He rocked it. The rest of the day was spent going through the boat getting our TTD (Things To Do) list filled out. 230 items, mostly like “Reinstall Engine” or “Install Watermaker.” Not too many like “Replace Cabinet Latch.” That’s cool. We’ve got 12 weeks left. It was great having Pender help us. Go see him in Wyoming this summer. He’s working at the lake renting canoes and boats and rescuing people who rent canoes and boats. In 2002, as the Open 50 Gyphron Solo (in Tommy Hilfiger colors), she set the world 24 hour solo sailing distance record, sailing 345 miles in 24 hours on its way to winning the Around Alone world race. She continued to race competitively for many years. Hopefully the key features show up in the picture: the crazy deep canting keel that they shift to windward to balance the wind on the sails, the dual daggerboards, the dual rudders, and the extremely flat hull shape. 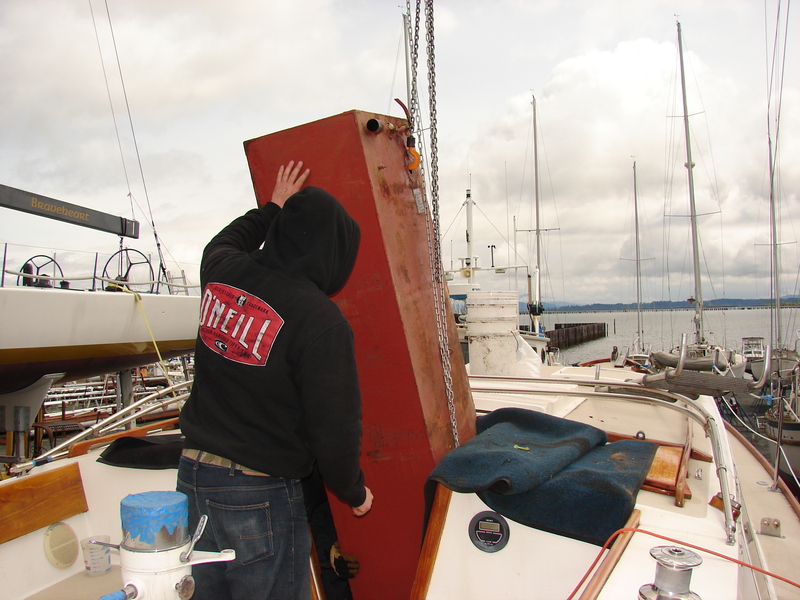 The rudders and keel are painted orange to make it easier for search-and-rescue to find the capsized boat. Here’s some video from a similar boat: http://www.youtube.com/watch?v=3r4_gT9ep3E. Sorry about the music. 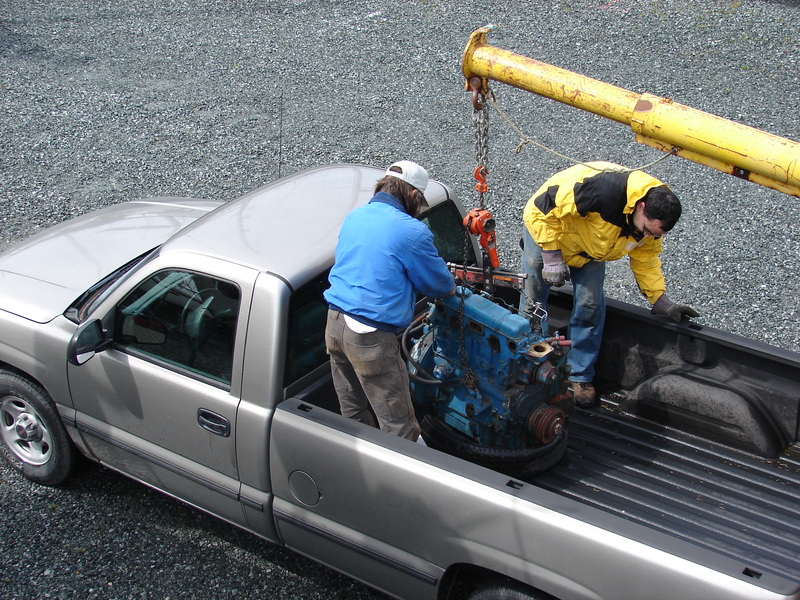 You can see Bright Water behind the fork lift. We’re cool, too. 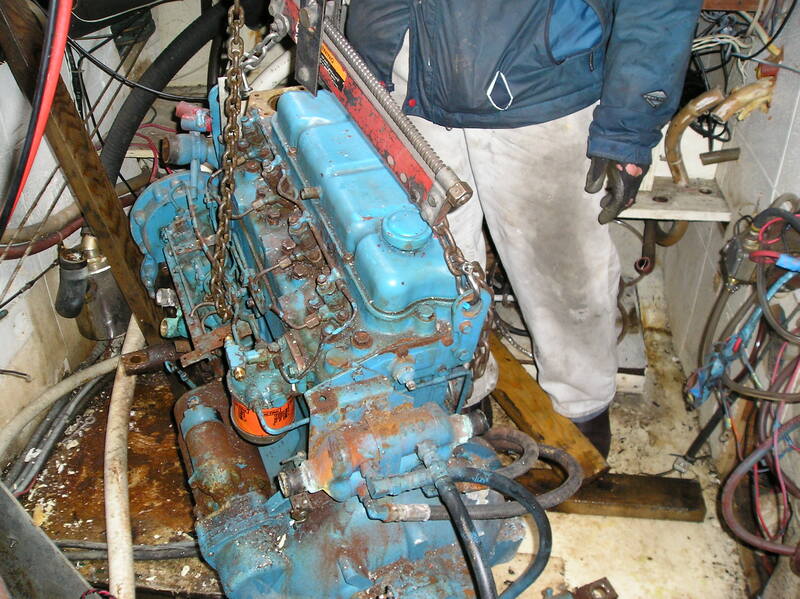 By the way, both fuel tanks were seeping diesel through the rust. A little soap, a little scrub, a little bleach, a little fresh air, and all is well.